(Santa Clara, CA - January 19th, 2010 ) - Milestone Internet Marketing announced today it won three silver awards in the recently concluded 2009 Adrian Awards Competition presented by the Hospitality Sales and Marketing Association International (HSMAI), the largest and most prestigious travel marketing competition globally. Out of nearly 1,100 entries submitted for this year's competition, Milestone was honored for its creative brilliance and best practices in web application design and programming for the hospitality and travel industries. The highlight among the award-winning entries is a silver award for eBuzz Connect™, Milestone's Social Media and Online Reputation Management System, in the Web Applications category. The system enables hotels to monitor and manage online reputation. 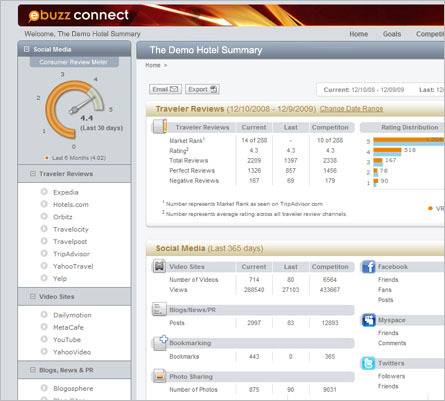 eBuzz Connect™ serves as an online reputation management guide and demystifies how hotels and businesses can maximize gains and track online performance in social media channels. eBuzz Connect™ offers powerful reporting and the ability to provide actionable reports that can help hotels improve services to customers and eventually increase profitability. "Probably the best of the social media monitoring tools on (Travel Innovation Summit) show. A very well designed dashboard which includes every area of social media coverage such as TripAdvisor, Facebook, blogs, forums, Twitter et al. The tool also allows specific keyword analysis and the ability to weight the importance of coverage on individual sites. Not a game-changer by any means, but a useful service." - Kevin May, Editor, Tnooz Talking Travel Tech. The Nick Hotel website (www.nickhotel.com) was revamped following sophisticated search engine optimization (SEO) guidelines, incorporates several Web2.0 features, and is promoted using organic, local, and social media optimization techniques and paid search marketing. Since the site launched in August 2009, direct online bookings have increased dramatically on a month to month comparison. In its launch month of August 2009, the website generated over 300% increase in online bookings compared to August from the previous year. The Historic Inns of Annapolis website (www.historicinnsofannapolis.com) was revamped keeping in mind the usability, relevancy, and the target clientele for the properties. Since the new website launched in late April 2009, website online bookings have increased from an average of 300 room nights per month to over 900 room nights per month.